While adapted to rich volcanic loams, it is tolerant of a wide range of soils as long as the drainage is good. It is at home in sands and even clay based soils, tolerating moderately acidic to alkaline pH conditions. Once established, trees can withstand both drought and flooding as long as these conditions do not persist too long. Ideally it is grown in full sun in a deep, well drained loam in a climate with long, hot summers, and frost-free winters. In the southeastern US, for example, it would be best suited to USDA cold hardiness zones 9 and 10, would be marginal in zone 8b, and at risk in zone 8a. Not surprisingly, peninsular Florida is home to many large specimens. In southern Japan it is grown without much effort as well, due to the relatively mild winters, hot summers, and rich volcanic soils. Propagation is from seed. Fresh seed will germinate within 2 to 3 months at temperatures above 30 C. If grown optimally seedlings can form pinnate leaves within a year or two. Trunk development starts around the fifth year. Young plants grow trunk slower than mature trees, with 30 centimeters of annual trunk growth possible for large, established specimens. 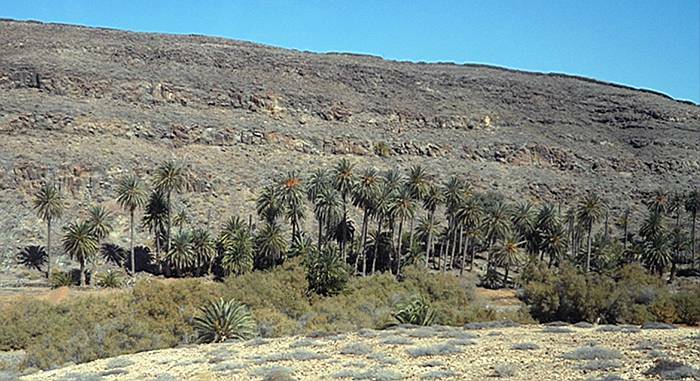 Phoenix canariensis growing in its native habitat can dominate some areas. These associations are known as “palmerales” by the local people. This group is growing in a dry area in a ravine near sea level that no doubt has some subterranean water, Fuerteventura, Canary Islands. Photo courtesy of Kevin Spence. 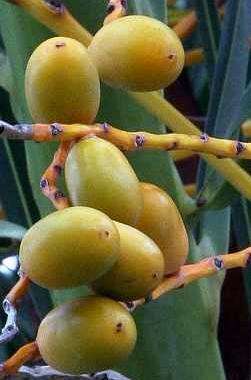 The Canary Island date palm is often transplanted as a mature tree. Root balls are cut up to a meter away from the trunk and two-thirds of the older fronds are removed to prevent water loss. The remaining fronds are bundled and bound with rope. To protect the trunk, fronds, and apical bud of the crown, wooden splints should be used. Damage to the trunk and especially the apical bud, can lead to the death of the tree. Additionally, newly transplanted trees need support scaffolding until firmly established. It goes without saying, a mature tree can only be handled by professionals with proper equipment – both a crane and large flat bed truck being necessities. One of the more interesting aspects of this palm is the amount of epiphytic flora one single tree can support. In humid climates it is very common to see the lower crown and adjacent upper trunk festooned with ferns. Nephrolepis sp. (Boston ferns) in particular seem to enjoy this palm as a host, at least in Florida and Japan. In its native islands it is host to a number of endemic plants that are not typically epiphytic – Sonchus species (sow thistles), Aeoniums (succulents), and various ferns. Apparently the petiole bases and fibrous trunk are perfect perches for plant roots, and retain enough water and nutrients to allow their growth. The dates produced by Phoenix canariensis ripen dark brown, but are not very fleshy. Hence, they make for poor eating. As with any plant, it has its problems, not the least of which is its truly massive adult size. I can’t tell you how many times I’ve seen young ones planted right up against house foundations or next to walkways. In both cases they outgrow their designated area in just a few seasons, pushing fronds right up the eves of a building (or though windows!) or completely blocking passage along walkways. Simply put, this is not a tree for small places. Remember that a mature crown can be 10 or more meters across. Also, it takes many years to produce a trunk high enough to walk under. As for small urban lots, even if you have the space, do you really want one tree to dominate your entire yard? In the end, this is a species for open landscapes with room to grow – as a large lawn specimen, in wide parks, and so on. Phoenix canariensis is also susceptible to nutrient deficiencies, particularly on poor, sandy soils. Potassium deficiency symptoms show as a yellowing of the oldest leaves accompanied by necrotic (dead tissue) spotting. As the condition progresses leaf tips begin to die as well. Since these often break off, the older fronds look quite ragged, while younger fronds can be completely unaffected. This deficiency not surprisingly also shortens the life of older fronds, thus weakening the tree. Magnesium deficiency is seen as a yellowing of the pinnae at the margins while the centers stay green, again, usually effecting older fronds. It is not uncommon for a tree to have both deficiencies at once, with the older leaves dying off prematurely from lack of potassium, the mid-aged fronds showing the yellowing of magnesium deficiency, and the newest fronds looking fine. The solution is simple – fertilize your trees regularly! In warm summer climates with high rainfall you may need to feed with a high potassium fertilizer up to three times a year (particularly on sandy soils). Be sure to get a fertilizer that has magnesium as well, or you can use epsom salts (magnesium sulfate) alongside your desired fertilizer. Slow release pelletized fertilizers should work quite well. In general, deep rich loam based soils should have enough natural nutrients to keep your palm happy. The removal of old fronds as a “remedy” for these deficiencies in fact weakens the tree even more since you are cutting off stores of nutrients that yet remain in the leaves. More seriously, P. canariensis is susceptible to various diseases and pests. Many of these are unfortunately fatal. Weevils, particularly in the genus Rhynchophorus, prey on this tree, often with disastrous results. In the southeastern US palmetto weevils (R. cruentatus) burrow into the heart of the palm, which leads to its death. Weevils are attracted to damaged trees, so after pruning or transplanting a tree, it is recommended to treat cut or damaged tissues with insecticide as a prophylactic. Cut petiole bases can also be tarred over. Once a tree is infested however, the only solution is to remove it and destroy it before adult weevils leave the tree and potentially infest nearby palms. 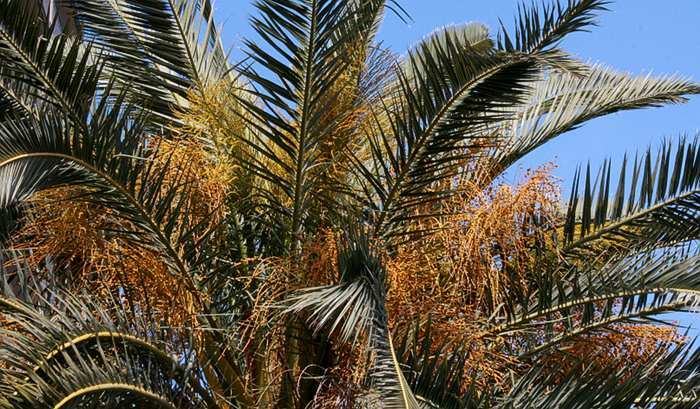 The Mediterranean area, Middle East, and north Africa have been progressively infested by the Asian red palm weevil, Rhynchophorus ferrugineus, affecting not only this species, but the commercially important date palm, Phoenix dactylifera. Recently it has been detected in the Americas as well, notably in Laguna Beach, California in 2010. Younger trees tend to be most prone to weevil infestation. Symptoms include the yellowing and wilting of the fronds starting at the center of the crown and progressing downward to the older fronds. Unfortunately, by this time the tree has become completely infested, with death being the most likely result. Systemic insecticides can be tried, but if the damage is too great it isn’t likely to save a tree. A wide variety of novel products have been devised to trap and kill them, and natural fungal controls (Beauveria bassiana for example) are being studied, but truthfully, this bug as got a leg up on the situation. 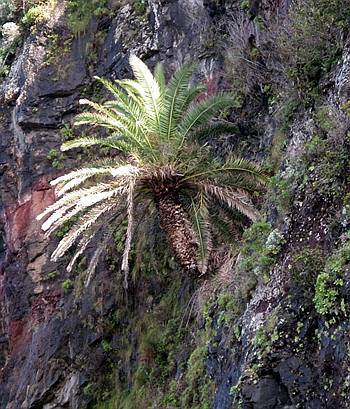 Phoenix canariensis growing on a cliff-face in its native islands, Maderia, near Santa. Photo courtesy of Kevin Spence. Another problem for this tree is fusarium wilt caused by the fungus Fusarium oxysporum f. sp. canariensis. This fungus isolate is specific to P. canariensis, and unfortunately infected trees are doomed since there is no known chemical or biological control. Symptoms start with a dying of leaflets along one side of the rachis accompanied by a reddish-brown strip. Older fronds die first, creating a skirt of dead fronds. The fungus works its way up the crown to younger fronds until the tree dies. Luckily, it seems the main reason for transmission of this fungus is through unsterilized pruning equipment. The upshot is that tools used for pruning must be adequately disinfected every time between pruning trees, no exceptions. Fortunately a number of cheap materials can be used to do this, notably household bleach (25% solution for 5 minutes) and rubbing alcohol (50% solution for 5 minutes). Clean solution should be re-made every couple hours if continuous pruning is necessary. Note that if chainsaws are used, then both the complete chain and saw bar need to be disassembled and disinfected between trees. While this may seem extreme, the results of infecting multiple trees can be far worse. Diseased trees must be removed and either burned or put in a landfill. Every effort should be made to clean up the work site as much as possible of any infected tissue. One should not plant a new P. canariensis in that location since the fungus can continue living in the infected rootmass for as long as it persists. So the best cure for this disease is prevention. Interestingly, petiole/rachis blight, caused by a variety of fungi, has similar symptoms to fusarium wilt, but is non-lethal. The only way to know if it is fusarium is to have infected tissue tested. If the results are negative, the trees don’t need to be removed, and may recover by increasing air circulation, making sure the trees aren’t nutrient stressed, and also by applying broad-spectrum or systemic foliar fungicides. In the end though, managing petiole/rachis blight is an inexact science, but at least the condition is non-lethal. Canary Island date palms produce an abundance of inflorescences. From what I’ve seen, regardless of the copious seed production, volunteer seedlings are not a serious problem in most situations. A word about pruning palms in general – don’t overdo it. 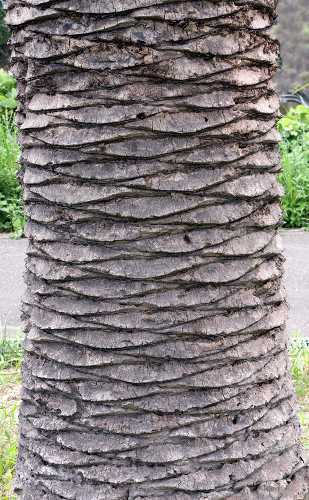 Too often palms are given such a severe pruning that it is a drag on the tree’s resources. Over pruning can lead to many problems including loss of vigor, reduction in the width of the trunk, and most importantly it can lead to making the tree more susceptible to attack by parasites and fungi. Remember that when you cut living tissue you are opening the palm up to outside diseases. A good rule of thumb is to never remove more than two thirds of the crown at any one time and ideally only dead fronds should be removed. 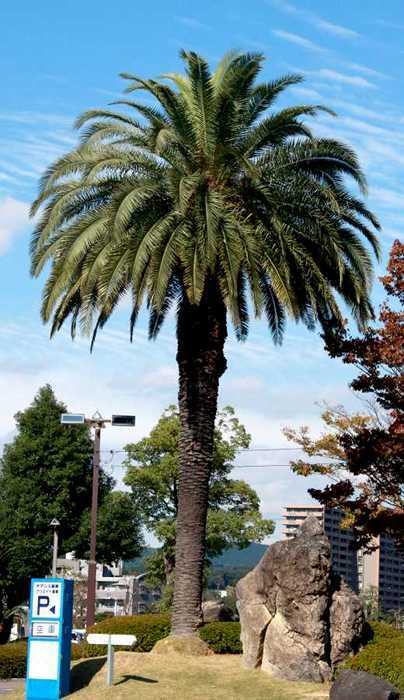 In the case of the Canary Island date palm, severe pruning of the crown to create what’s known as the “pineapple” shape is something to be discouraged, especially if the tree has been recently transplanted. A healthy tree is in the end much more resistant to outside pathogens, so that means growers should aim to maximize overall vigor through adequate watering, fertilizing, and using a sensible pruning regimen. In summary, this is a fascinating and surprisingly tolerant palm species. If you’d like to give it a go, you’ll need to consider the tree’s special requirements, and evaluate if it is sensible to take a stab at growing one yourself. I recently purchased a property in the highlands of Mexico that had two of this type of palm. both were very tall and had died. We have cut the trunk in to beams that we are considering using to make stalls for horses. Is there some special way of treating the wood? Our plan is to let the cut beams dry in a flat protected area so they will not twist. Any suggestions or comments – pro or con for this idea? Wow, you cut large palms into beams? That is almost hard to believe. What device did you use? My impression was that it is really difficult to saw a palm. As for using the wood for horse stalls – I have no idea. Since palm trees do not produce true wood, they will not likely dry in the same manner as normal wood. So, I can’t be much help in answering your question, though keeping them dry and at a constant temperature seems a reasonable approach. Anybody else have experience with palm wood? Nice to read that ‘our’ palm is appreciated elsewhere, too! Just one thing to add – Phoenix canariensis grows from sea-level (Palmeral de Maspalomas for ex.) up to 1.500masl. Palm communities mostly occur at lower altitudes. Hybrids with Ph. dactylifera can be distinguished by leaf colour (more blueish in dactylifera) the length of fronds (shorter in dactylifera) and the average stem thickness (thicker with Ph. canariensis). There are more characteristics to distinguish both species, but these are the easiest. Difficulties arise when you have an hybrid swarm. The solution on Gran Canaria island was to eradicate them all in the past and allow only new plantations with true Ph. canariensis. But you can still see Ph. dactylifera as street-tree with fleshy dates. It is a gorgeous palm, sadly often so heavily pruned that many palms die afterwards due to wind damage. Advice please…our canary island grew from a seed – a “volunteer’ as my mom called it. It’s in a very small yard surrounded on two sides by a block wall fence so it would be difficult to remove. Besides it is too beautiful. Surrounding’s require annual pruning. My husband likes the ‘pineapple’ look and has been careful in cleaning tools as recommended. My concern is that the fronds that are being cut back are being left too long without cutting back to the trunk. Some have fallen out and seem mushy. I’m guessing this weakens the tree and trunk? “The practice of trimming CIDP leaves into a “pineapple” shape is highly discouraged, not only because it removes leaves needed for potassium nutrition, but because these cut leaf wounds are strong attractants for palmetto weevils. The smaller silky cane weevil (Metamasius hemipterus) also attacks CIDP, but these weevils tend to remain in the leaf bases and do not kill the palm by themselves. However, the wounds they create in the leaf bases attract the more destructive palmetto weevils that can ultimately kill the tree. I hope this helps. Good growing! We have a beautiful Canary Palm that is about 15 years old and about 20 ft tall. We recently had it cut back for the spring like we do each year and it looked great (we never over prune, took off maybe 2 rounds of prawns total). Then 2 weeks ago we had a huge storm and found a healthy prawn (about 8′ long) just fell from the center of the tree. We assumed the wind caught it just right. But today, a beautiful sunny day with no wind, I went in the yard and found another perfectly healthy prawn had fallen off. There seems to be a little damage to area where the prawn snapped off, but not much. The rest of the prawn is in perfect shape. Any clue why this is happening? Difficult to diagnose at a distance, but I would definitely have the fallen fronds checked for disease. Most states have public agencies (such as IFAS in Florida) that will do testing for little or no money. I’m not sure if I understand you exactly – did the fronds break at the base, or did they break in half? If the fronds are breaking in half, that is strange since these are very strong in healthy trees. It could be a combination of factors – insect damage during growth causing weak spots, a fungal pathogen or even maybe nutrient deficiencies. If they are breaking off at the crown, that could mean you have a bigger problem such as weevil infestation. Either way, I’d have the tree checked by a specialist. The only effective may to protect your palms is having them sprayed at least every 3 months. I am the proud owner of a 65ft Canary Palm which was planted in the year 1900. I am concerned about how long will live before falling due high winds or decay. I have never trimmed more than half the shoots and tried to remove most of the seed pods due to the mess they cause in my swimming pool which is 10ft away. The shoots or palm leaves are more than 15ft long. Please advise. Thank you. Canary Island Date Palms likely can live 300 or more years, so as long as your tree is healthy I don’t think it will pose a problem. Trimming a tree that high demands a professional crew in my opinion, particularly if it is close to structures. Those fronds are dangerous when they fall and are surprisingly heavy. Sounds like a beautiful palm – good luck! I am the recent owner of a house which includes in the backyard a Canary Palm tree, approx 25 to 30ft tall. Probably 50yrs old according to the house construction license date and plans. According to the previous owners (which were not the original owners) the tree has always been treated to prevent the weevil infestation that is badly disseminated in this area (Algarve, south of Portugal). Nevertheless, there is one generation of older leaves (perhaps 6 or 7 years old) that shows a bit of ‘eating’ by the weevil larva. Leaves prior and recent to this ones are healthy. So the tree appeared healthy and with the weevil infestation controlled… well, since the tree belongs to my family now (since October 2016), our gardener crew has been treating it with anti-weevil product (the one that sticks to the trunk through a hole and the tree ‘drinks’ from, cant remember the name now…). Is there anything that could be done? I’ve heard stories and there is a couple of examples in my town of old Canary Palm trees that were attacked by weevil, left for dead without trees but eventually a new sprout of leaves appeared after some years… I don’t want to be overly optimistic, but is it possible? Could the tree regain its strenght and regrow a new sprout of leaves from the top? Well, my gardening crew started to work on the palm tree and now we have more news about why and how this happened. Two weeks ago the wind was very strong and the top sprouts fell to the ground, we now fear that the tree is really as good as dead since there’s no new leaves coming out of the center. It seems that the first time the tree was attacked by the weevil bug (some 5/6 years ago), although the response was fast with treatment, the bugs and larvae that died started to rot inside the top part of the tree (we call it ‘pineapple’ here, because of the shape). the organic material then started to be a really good ground for other bacteria and bugs to grow and fester on, as well as several parasite plants that grew inside. The plant kept going healthy and sprouting new leaves every year, but some of its innards were being eaten slowly (not the core, since the tree has been treated ever since). 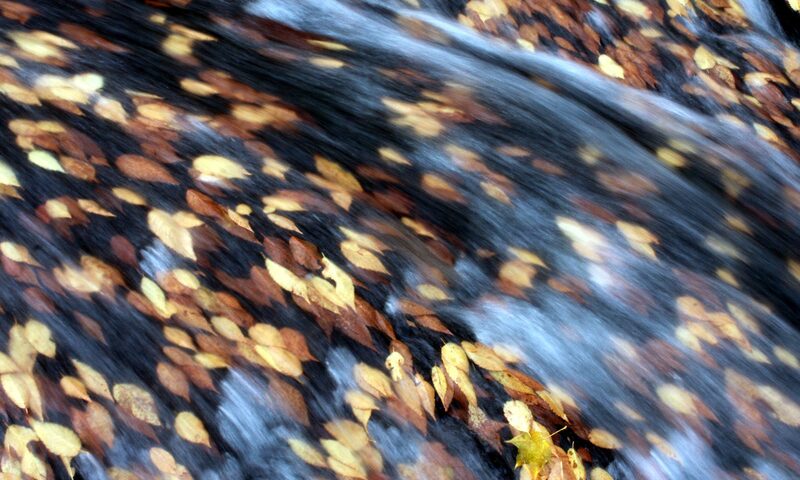 The sprouting became too loose and fragile, and the strong winds did the rest. We keep treating the tree so the weevil doesn’t nest in the remaining healthy core, but with no young leaves growing the gardeners say we have 50% chance that the tree dies. We cannot preview the outcome, although there are several same species palm trees around here that also lost all their leaves and then a couple years later a new sprout appeared. Found your site to be very informative. Thanks. I have a couple of healthy Canary Palms (Phoenix AZ area) which I am thinking are about 15-20 years of age. I have been pruning them over the past 4 years, removing fronds that are below 3 and 9 O’clock mostly due to the fact they impede walkways. Removing the seed heads is a chore and I was wondering should I wait until they are filled out and about to fall to the ground or can I do it earlier. If I do it earlier, does this stimulate the tree to produce more seed heads and increase my pruning work or are the seed heads produced on a seasonal basis. Also are there male and female trees and do the males produce seed heads? Is there a correct terminology for the seed producing frond? Hello- I am the new owner of a place with a palm tree that I suspect may be 100 years old, definitely more than 50 according to photographic proof. I have no record of any pruning or care for this tree. How often should I have this pruned? what is the recommended care for this tree? During rains and heavy winds, brown, spiky, heavy fronds and what looks like coconut shell kind of material tends to fall off. the fronds even pulled down a cable to the house, which happened to only be a internet/cable and not a power line, but it was still worrisome. Thank you!! I recommend having a professional tree trimmer to come in once a year (fall is fine) to clean away any fronds that are dying and ready to fall. I don’t recommend having them prune living fronds off, just the ones that are soon to die or are already dead. Removal of old flowering stems/fruit clusters is recommended as well. The tree pictured at the top of this article is perfectly pruned in my opinion.